There’s a fair chance that our household goes through more hot sauce than any other in the Twin Cities. I often wish it was sold in vats, rather than puny little bottles. Speaking of those bottles, we have no fewer than six different kinds of hot sauce in the refrigerator. And I’ve just added a seventh– my own. 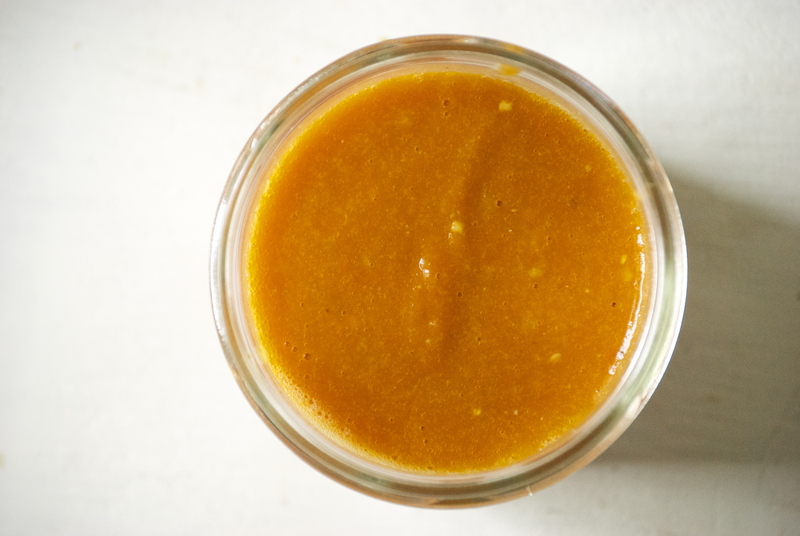 I knew I wanted to make hot sauce this year, and I was initially interested in making a fermented version. But after talking to a vendor at our farmers market (and I love his unfermented styles), I decided to forge ahead and make a fresh super-spicy version. This hot sauce is not for the timid. It will make you tough or else destroy you. 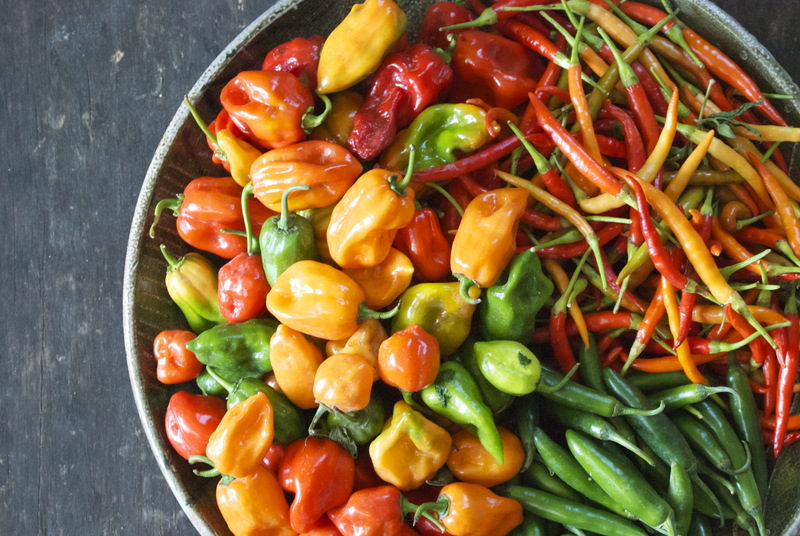 The primary pepper is the amazing habanero. I just love it’s unique, sweet, flavor. With the first bite, it plays nice, and you think, “That’s not so hot.” But then the burn starts to build. Of course, you keep eating because it tastes so good, and while the heat is ratcheting up, you think you can handle it. You start sweating, thinking maybe you should go grab a glass of milk, but no, just one more bite. And then your face melts off. That’s this hot sauce. Obviously this recipe isn’t for everyone. But, for those of you who enjoy a good habanero hot sauce, it’s pretty darn amazing. 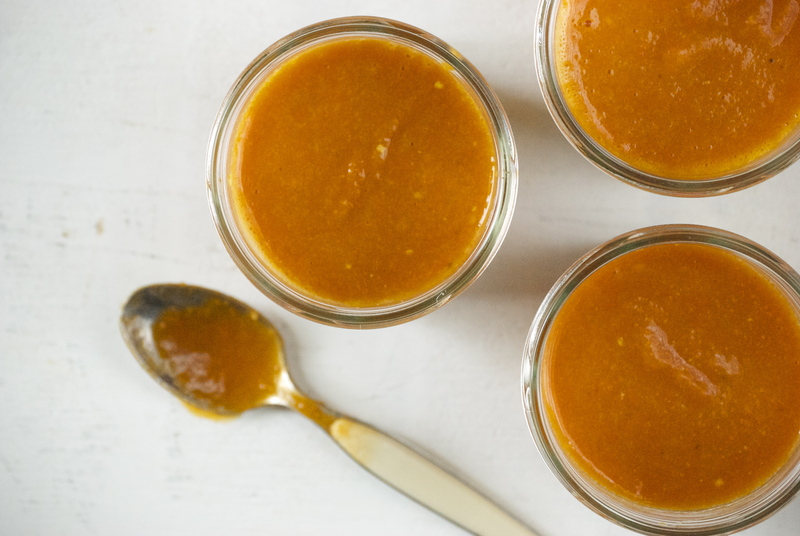 It has a nice balanced combination of the sweet habanero flavor, a bit of garlic, and vinegar. It’s also really easy to make. I decided against making a canned version, instead opting for something that will keep for a while in my refrigerator. I haven’t tracked down any cute little hot-sauce bottles in the area yet (hence the jars you see here), but I found some on Amazon that are going to work marvelously. Enjoy! Note: Working with habaneros is serious business. Use plastic or latex gloves, if you have them. Be careful of what you touch. Also, be mindful of how close you breath-in near the chopped peppers– or coughing will ensue. Carefully remove the stems from the habaneros and chop them, seeds and all. 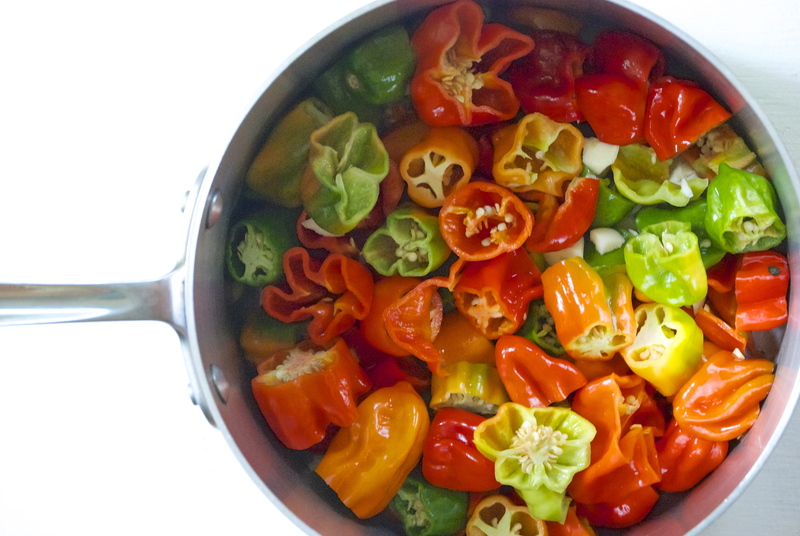 Place the habaneros, garlic, salt, and 2 1/4 cups of white vinegar in a large saucepan. Cook the habaneros on medium/high heat for about 30 minutes, or until the peppers feel a bit soft to the touch (note: be cautious when removing the lid to check the peppers). When they are soft enough, place the mixture into a blender, or food processor. Blend until smooth. Taste. If you still want a bit more tang, add the remaining 1/4 cup of vinegar. Place in jars or bottles and store in the refrigerator. Enjoy! I ate a lot of habanero sauce when I was in Mexico last week and I’m in love with its heat. I’m definitely going to keep my eyes out for the peppers here so I can make it and have a never ending supply! I bet you tasted some amazing sauces while visiting there! I’m jealous! I am so happy I found this. How long do you think this will keep in the fridge? Hi Randi, I can’t give you a definite number. There is plenty of vinegar in the sauce– so it should keep well for a few weeks, at the very least. Check it before you use it– if it appears to look and smell fine, it should be good to go.